In the far away mountains of the Land of Mary, lurks an unfriendly dog, just a little bit scary, with red saucer eyes, and a coat of coal black. Should you stumble upon him, you won’t make it back. Seen only at night, but never the day, ‘round Hagerstown, Maryland, he stalks human prey. He may be a ghost, for this we allow. The creature we feature, the Snarly Yow. The Snarly Yow, I said it, it’s true. A strange name indeed, and frightening, too. 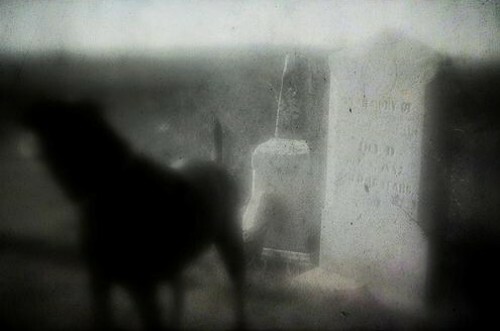 Phantom black dogs are seen, so they say, from Yorkshire to Norfolk and further away. With odd noms de plume like Black Shuck and Barghest, but the American Snarly dwells much farther west. Black dogs? No worries, I’ve seen two today. What makes these poor canines fill us with dismay? Black dogs it would seem are related to death, in Europe portending your last dying breath. As migrants they settled the Blue Ridge milieu, the black dogs they joined them, as legends they grew. And this psychopomp pet still seen to this day, scares children and adults in just the same way. When did we first hear the strange name “Snarly Yow”? Its not common parlance, I rather avow. Charles Dickens once used it. Referred to a cur, a woebegone doggy with blood on his fur (Dickens, 1860, p259). And Frederick Marryat, a captain turned author, told stories of ship’s dogs you ought not to bother (Marryat, original 1827, reprint 1896). Etymologists swear it goes back even more, as a word for resentment, and “grumbling” galore (Farmer, 1890, p227). And should you encounter this angry black critter, it will be quite cross, thus the name can’t be much fitter. What makes this dog different, I hear you to ask? I will soon now show you, so on to our task. He’s larger than your average hound, a match for a human compared pound for pound. And vicious (hence “Snarly”), his rage he displays, with fire in his eyes and a lean, hungry gaze. And mostly, he’s ghostly, for bullets pass through, no trace of his presence remains, it is true. Men of the mountain, brave hunters aver, they’ve encountered this monster, and filled them with terror. Dear Snarly is known to stand firm in the road, blocking the way through his forest abode, menace poor mortals, and then disappear, leaving behind only remnants of fear. On South Mountain we’re told, a great battle was fought, a part of the Civil War Gettysburg plot. Thousands of soldiers died near the spot, where Snarly Yow’s hauntings are phantomly wrought. Perhaps he remains and it is for the best, to guide fallen soldiers away to their rest, for even as fearsome and apt not to bend, like most dogs eternal, a man’s true best friend. Thus ends our tale of the Snarly Yow. Part cryptid, part phantom, we know not just how. Though shocked when you see him, we need to be fair. He’s never hurt no one, just gave them a scare. Should you find him afoot down Burkittsville way, repeat then the mantra, “Sit boy, now stay”. Dahlgren, Madeleine Vinton, 1825-1898. South-Mountain Magic: a Narrative. Hagerstown, Md. : Staff Association of the WashingtonCounty Free Library, 1975. Dickens, Charles, 1837-1896. “Street Dogs of Constantinople”. All the Year Round. London: Charles Dickens, 1860. Farmer, John Stephen, 1845-1915. Slang and Its Analogues Past And Present: A Dictionary … With Synonyms In English, French … Etc. Compiled by J.S. Farmer [and W.E. Henley]. [London: Harrison & Sons, 1890. Marryat, Frederick, 1792-1848. The Novels of Captain Marryat. London: J.M. Dent, 1896. Love, love, love the rhyming! Many thanks! I have a new found respect for Dr. Seuss.